The intent of this six-part research series is to gather data from Canadians by Canadians over a 12-month period. It will give us a Canadian perspective on corporate and community social responsibility and allow us to track attitudes and behaviour over time. 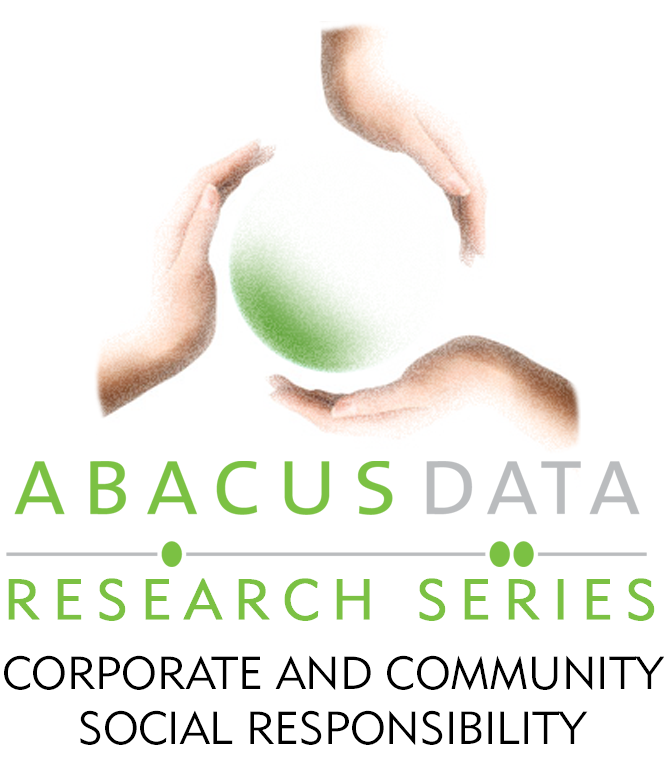 A new survey from Abacus Data and the Corporate and Community Social Responsibility Conference finds that 41% of Canadians surveyed have a favourable impression of the Occupy Canada protests while 22% have an unfavourable impression. While most Canadians agree with many of the arguments of the protestors, few believe the protests will have a positive impact on Canadian politics. Canadians are split on their opinion of the protests. About four in ten respondents (41%) said they had a favourable impression of the protests while 22% said they had an unfavourable impression. Eighteen percent were neutral while another 18% did not know enough to have an opinion. Of note, there was little difference of opinion across age groups or among community type (urban vs. rural). However, political differences did exist. NDP supporters were more likely to have a favourable impression of the protests (56%) than Conservative Party supporters (26%). BQ supporters were the most supportive with 81% saying they had a favourable impression of the protests. Despite the fact that 41% of Canadians have a favourable impression of the protests and a large majority of Canadians agree with many of the arguments the protests are making, few believe the protests will have a positive impact on Canadian politics. 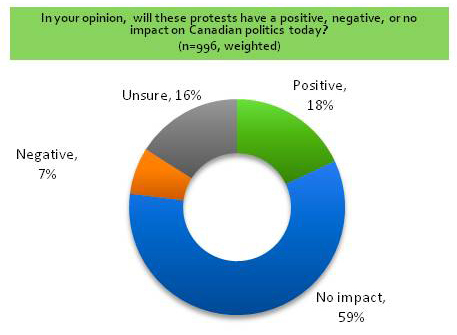 Under one in five respondents (18%) said the protests would have a positive impact while 59% believed that they would have no impact on Canadian politics. This cynicism is not surprising if we consider that 81% of Canadians agree that corporations and the rich have too much influence over politics in Canada. If governments are overly influenced by the interests of corporations and the rich, why would government respond to these protests. The Wealth Gap: Canada vs. the U.S.
Canadians were more likely to believe that the gap between the rich and poor in Canada is smaller than in the U.S.. Four in ten respondents (43%) said the gap was smaller in Canada than in the United States, while 36% said it was about the same, while 13% said it was larger. There was no significant difference of opinion between men or women. However, younger Canadians were more likely to think the gap was smaller (57% smaller) compared with Canadians over the age of 44 (37% smaller). 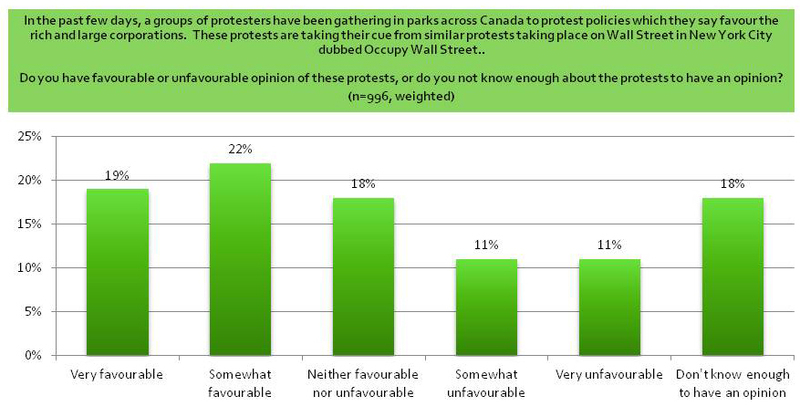 Large majorities of Canadians agree with the arguments being made by Occupy Canada protestors. 81% agree that corporations and the rich have too much influence over public policy and politics in Canada. 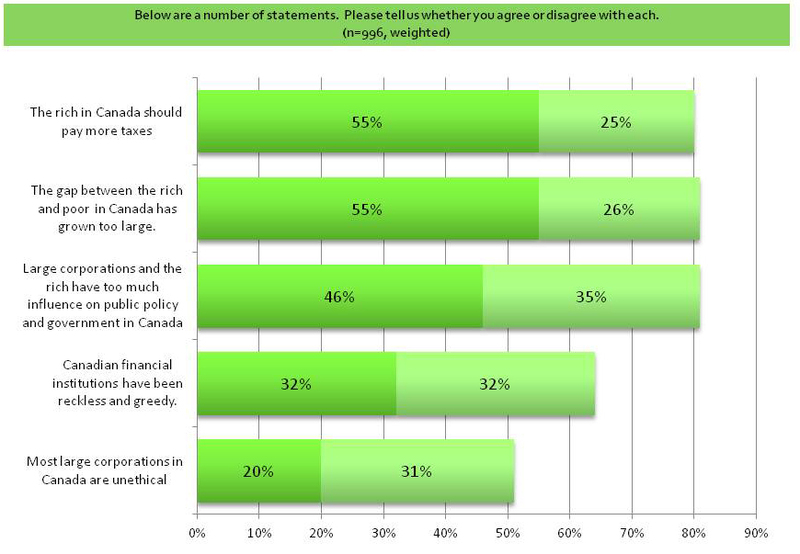 64% agree that Canadian financial institutions have been reckless and greedy. 51% agree that most Canadian corporations are unethical. Download the full report or detailed tabs. From October 19 to 21, 2011, Abacus Data Inc. conducted an online survey among 1,005 randomly selected Canadian adults from an online panel of over 150,000 Canadians. There is technically no margin of error since the survey was not conducted using a probability sample. The margin of error for a survey of 1,005 respondents using a probability sample is +/- 3.1%, 19 times out of 20.